On today’s show we take your questions on buying wine for the booze-bus, gift card quandaries, fold over cards, unexpected visitors during naps, and a question about saying thank you instead of I’m sorry. Plus your feedback, etiquette salute and postscript segment on thank-you notes. 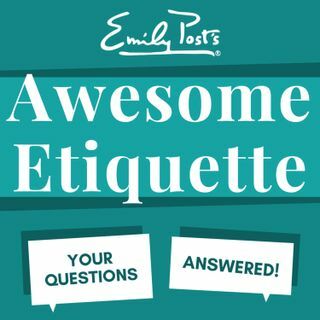 For Awesome Etiquette sustaining members your extra question of the week is about what you do with your purse at a party.